Great coaching and high-character players are two of the many things that help make the Brophy tennis program special. Head coach Eric Chalmers said his team was missing a philanthropy project. A project his guys could be heavily invested in. The tennis team was the only athletic program at Brophy without a philanthropy project. One of the goals of Brophy as a Catholic, Jesuit school is being able to develop servant leaders. The Broncos decided to work with ACEing Autism, after being referred to the organization by Griffin Wong, a Brophy alumnus. ACEing Autism is an organization where volunteers help teach kids with autism spectrum disorder how to play tennis. There are 80 to 90 program sites across the United States. Brophy has a direct partnership with the ACEing Autism program site in Phoenix, sending two to eight players from their varsity squad each week when the program is in session. Sessions typically last eight weeks. Marget’s passion for volunteering came in seventh grade when he was a part of Kids Enjoy Exercise Now (KEEN) and volunteering as a member of their organization. He was the first one to volunteer when Chalmers and Chad Campbell, the program site director of ACEing Autism, needed someone to be their director of clinics. Campbell said he doesn’t believe the winter session would have run as smoothly without Marget’s help. Several of the Broncos junior varsity members volunteered multiple times too. The experience helped the Broncos grow as a team and a program. The tennis sessions were on Saturday mornings and lasted an hour. The lessons have a similar structure so the kids participating could get in a routine. Everyone on the team took part in training, too. ACEing Autism trains all the coaches on how to work with developmentally challenged kids before they volunteer at a session. The organization had 15 kids this past session. The program has at least one coach per kid every session to make sure each kid gets one-on-one attention. The Broncos did everything they were asked and more. The organization has only been in Phoenix for the past two years, but the program size continues to grow during each session. 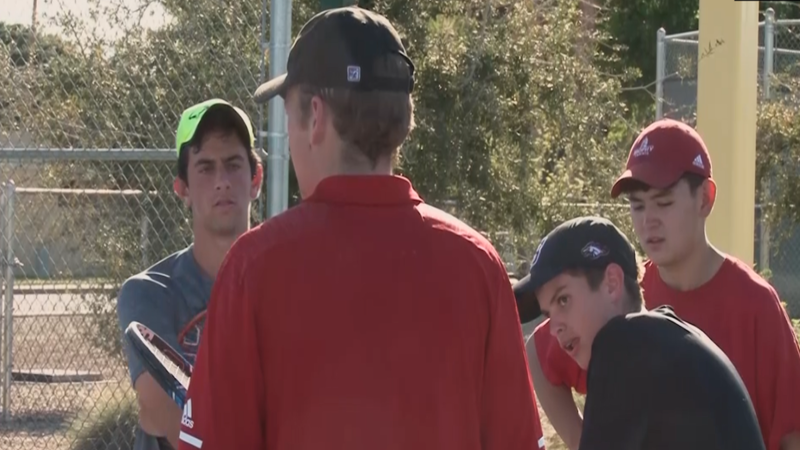 Brophy tennis hopes to help ACEing Autism to continue to grow as they carry out their school’s mission “developing Men for Others to serve the world”.